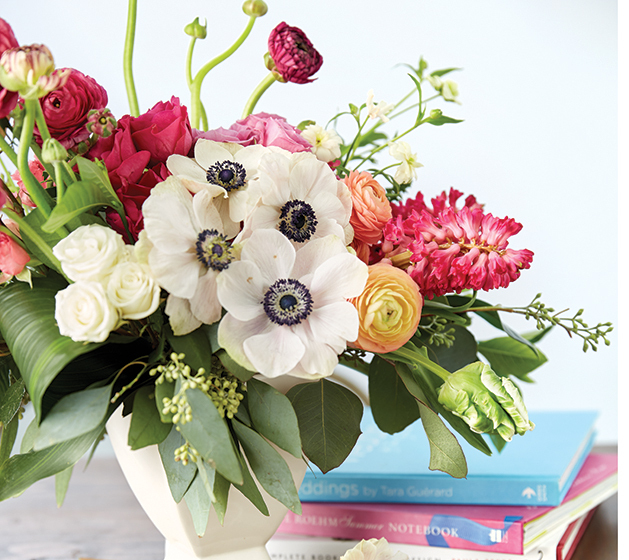 Edina floral business expands to offer experiential events. “Flowers are a way to celebrate, a way to tie people together. They’re such a unifying thing,” Bridget Connell, part of the dynamic duo behind Haute House Studio, says. She and business partner, Marsha Hunt are sitting in their office in front of a display of centerpieces. The business encompasses wedding and event flowers and planning, day-of coordination, corporate and private events and designs as well as creative classes. Connell, an event planner, and Hunt, a florist, started their business in 2010. The business is literally expanding with this month’s opening of a 2,200 square-foot business office building on Lincoln Drive in Edina. This was formerly a home-based business with a studio housed at Hunt’s residence. Hunt says they could have moved long ago, but have been looking for warehouse space in Edina for years. The new venue will allow them to hold classes and events, two key pillars of their new community-building platform. Classes are holiday-themed. There are also flower-arranging classes and even private flower arranging parties that people can book. But Hunt says what they are most proud of is their unique blend of creative experiences: pairing classes in collaboration with local makers and artists. They are also planning events with calligraphers, cookie designers and perfume makers to name just a few. 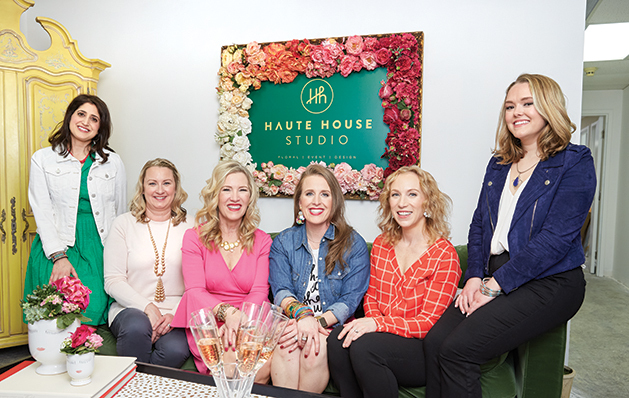 Classes aside, a blooming part of Haute House Studio is its expanding event planning services. “We can do everything from the initial plan, to the follow through, to the ordering of rentals and the fresh florals,” says Connell. In addition to weddings and corporate events, they’ve seen a rise in private parties. The growing event planning side of the business has led to growth in staffing. Sonia Prickett joined the creative division last August. She specializes in floral design. Prickett is joined by Edina moms Betsy Mulvehill and Melissa Levy. Mulvehill is an event and wedding planner. Levy is an office manager and strategist. Hunt and Connell are excited for the spring season, and say the Pantone color of the year, Living Coral, will drive trends. Hunt says she was inspired by a recent trip to Europe. “That’s where we tend to see trends starting from before they catch on here. I picked up a lot of vintage botanical prints ... The same true colors from nature that they reproduced so well in those old botanical prints–that’s what’s modern today,” Hunt says. She adds that colors are turning away from brown, dull undertones and leaning toward bold, crisp hues. In addition to bold color, Connell explains texture is key. For pots, Hunt says while people love metallics, she is seeing more emphasis on stoneware and earthenware with natural finishes such as cement and stone, but the finish is clean and matte, not rustic or shiny. The Haute House owners would eventually like to have their own greenhouse. In the meantime, they use the acre of land around Hunt’s home. 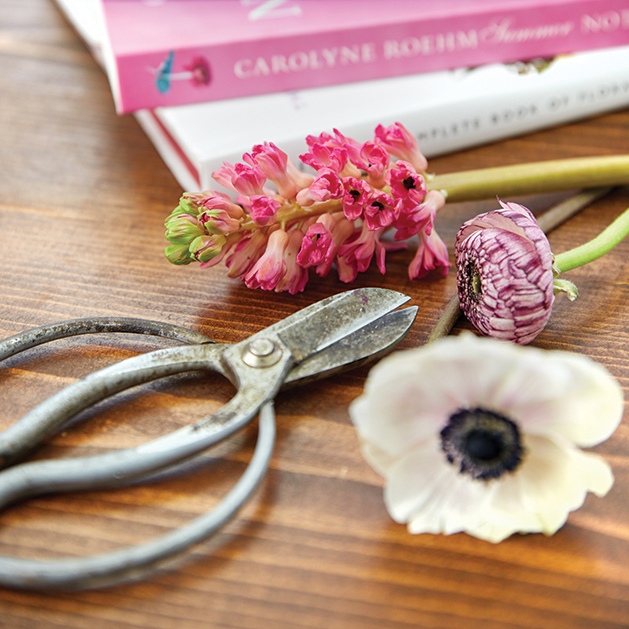 “We source a lot of foliage for the spring, summer and fall from our own gardens, even some of the blooms,” Hunt says. Many are sourced locally and sometimes planted with purpose. She remembers a bride last summer who had just lost her grandmother who was the matriarch of the family. It was a Jewish wedding, and Hunt was making a chuppah, the traditional canopy a couple stand under during the wedding. Special thanks to Desiree Graybill of Make Me Blush Artistry as well as Greta Olson Anderson for their makeup styling expertise at this fun photo shoot. Also Rudy's Rentals for providing several props for this on location photo shoot.